Shallow Thoughts » Where has Mugsy gone? When last we saw Mugsy, he was looking to hitch a ride to Hollywood. Being in the back hills of Tennessee he was picked up rather quickly by some rednecks willing to help him along. No need to cue the Dueling Banjos theme from Deliverance. Nothing unseemly occurred with these gentle hill folk. Things seemed to be going well until Mugsy tried to climb into Granny Moses’ rocker on the back of the truck. Granny pitched a fit and threw Mugsy out! Once again, Mugsy was left to his own devices. 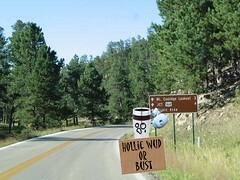 Having no clue where he was, Mugsy began hiking around the terrain, trying to make his way west to California. Even though he is made of a metallic substance, Mugsy had no innate sense of direction and headed pretty far north from the path that would lead him to his desired destination. Having spent a great deal of time with the people in the region recanting the tales of his excursion, Mugsy became quite the local hero. As such, the town people opted to memorialize him in the only way they knew. Even though the people of South Dakota welcomed Mugsy with open arms, he couldn’t quell the longing inside him to reach Hollywood. Will he get there? Subscribe to comments with RSS or TrackBack to 'Where has Mugsy gone?'. 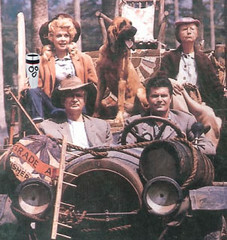 When you said Mugsy was a travel mug, you weren’t kidding. Mugsy will get there. If he can get his face on Mount Rushmore, Hollywood’s a given.